Garden flags are the perfect way to greet family, friends and guests! They’re an easy outdoor decoration that cheers up a yard, makes it appear inviting to anyone passing by, and is the perfect way to show your love for a holiday or special occasion. However you choose, there are countless ways to decorate that are easy, inexpensive and are sure to spice up your yard. 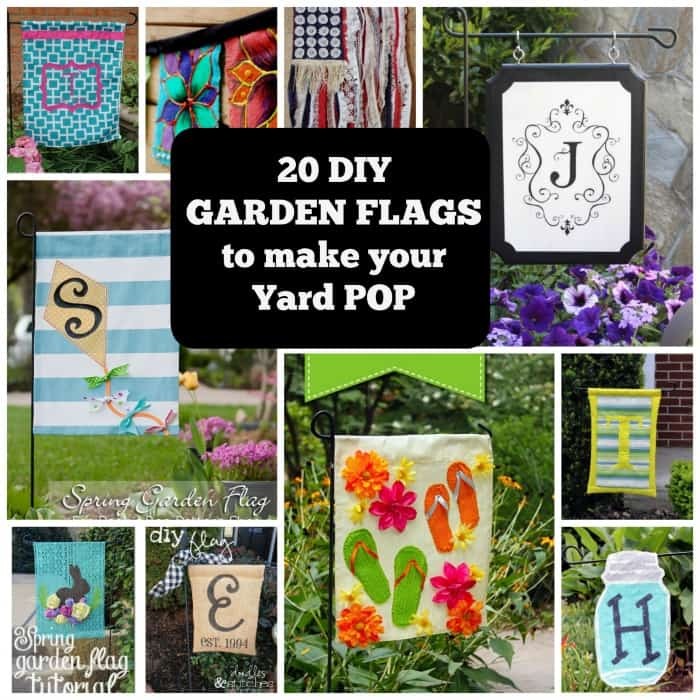 We rounded up 20 of the best DIY Garden Flags that will make your yard pop! 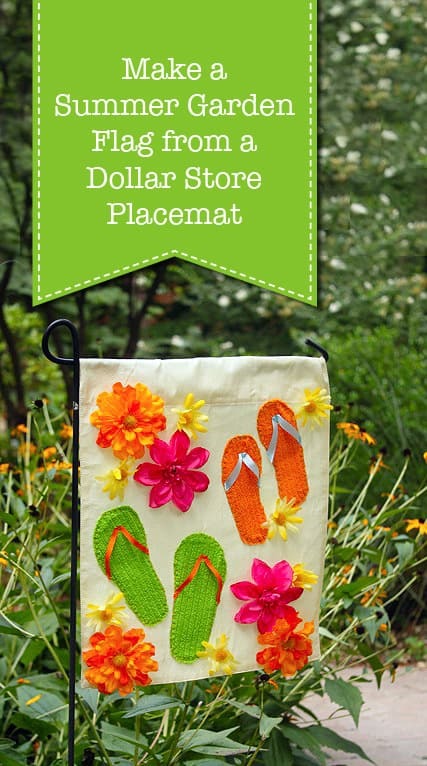 Show your love for warm weather with this DIY Summer Garden Flag from Pretty Handy Girl made from a Dollar store placement and terry cloth towels. This DIY No-Sew Monogrammed Burlap Garden Flag is a stylish addition to the front entry of any home. Put a personal touch on it for a warm and inviting custom accent! Celebrate the first signs of spring with this DIY Spring Garden Flag from Peek A Boo and it can be personalized in so many ways! Make you garden pop with an elegant Monogrammed Outdoor Sign. A fun spin on a garden flag that Confessions of a Serial DIYer makes it look so easy to do! Let the computer do most of the work with this creative DIY Spring Garden Flag! Erin Bassett shows you how to using a ScanNCut technique. 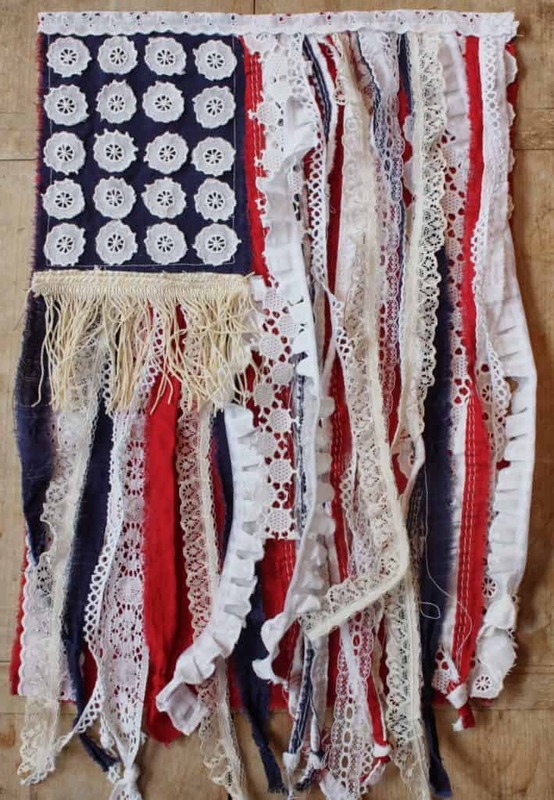 Show your patriotism with this frilly God Bless America Flag. Made from strips of fabric and lace, My Sweet Savannah makes it looks so easy! Mason jars aren’t just for the kitchen. Show your mason jar love with this adorable DIY Mason Jar Flag made from burlap from The Country Chic Cottage. Show off your creativity with this DIY Summer Garden Flag made with Ruffles & Muslin from Craftionary. It’s so easy and as cute as a dress! Sometimes simple is all you need! Doodles & Stitches shows you how to make a simple DIY Burlap Flag using a vinyl stencil. Team T Adventures transforms inexpensive upholstery sample swatches into this gorgeous Summery Garden Flag. Easy to do and easily customizable too! Scare away those Halloween goblins with this Burlap Scarecrow Garden Flag. The Country Chic Cottage shares a video tutorial on how to make this DIY garden flag in a breeze. Dress up your yard from Home Talk with this simple tutorial that requires minimal supplies and no sewing for creating a DIY Autumn Garden Flag with a free printable! Welcome friends and family to your home with a colorful DIY Embroidered Garden Flag. Embroidery Library Projects shows you how easy it can be done. Easily adaptable for summer, autumn, winter and the holidays too! Fall for fall! Pretty Handy Girl show you in this step by step video how to embrace a new season with this DIY Fall Leaves Garden Flag! Serenity Now has a clever way of making a DIY Monogram Garden Flag oh so pretty using heat transfer. Check it out and wait for everyone to ask you where you got it! 4th of July fanatic? We are too! The Proper uses wooden paint sticks to create DIY 4th of July Paint Stick Garden Flags. So creative and incredibly easy to make too! These DIY Bohemian Garden Flags from iLoveToCreate are perfect for a party! Use heat transfer vinyl on burlap to create a fun, cheerful, and welcoming burlap garden flag. Perfect for cheering up a front lawn or patio! Unoriginal Mom shows you how to make this DIY Burlap Garden Flag with Heat Transfer Vinyl. How cute are hearts? Show the world how much you love Valentine’s day by making this cute DIY Garden Flag for Valentine’s Day using felt and burlap with this step by step tutorial from The V Spot. Another 4th of July inspiration! We bet this DIY Red, White & Blue Garden Flag looks gorgeous blowing in the wind. Pop over to Farmhouse Chic Blog to get the how to and show your patriotism!